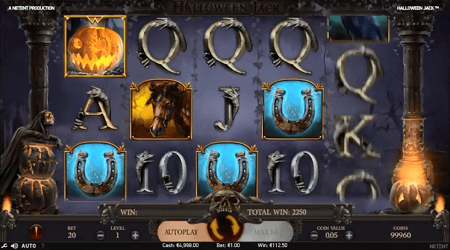 Scaredy-cats should read the following review during the day, because they might get a bit scared of the newest NetEnt product Halloween Jack, a five-reel video slot with 20 fixed paylines. The entire game looks scary, being set on a dark cemetery, with Skeletons, Vampires Ravens and creepy playing cards appearing. However, the bravest among you who dare to spin the reels will benefit from free spins, Walking Wilds and three types of Wild Extras that may appear. Get Stacked Hell Hound Wild, Stacked Jack-o’-lantern Wild and the Expanding Death Reaper Wild on the reels for massive wins. Once again, we will stress the fact that the 2018 release is really scary, so cover your eyes if you see something that frightens you. A female Vampire is leading the group of terrifying animals and things you may find on a graveyard. There will be Ravens, Horses, Bats, Horseshoes and 10-A playing cards that act as low-value symbols. The Wild Halloween Pumpkin will substitute for all symbols except the Chest Scatter, which triggers free spins, and the Lantern, which is collected for the Wilds in free spins: Hell Hound Wild, Jack-o’-lantern Wild and the Death Reaper Wild. Still not afraid? Then we might scare you off with the rules of the game. Of course, we are just kidding, because gameplay is as easy as pie. The NetEnt product features five reels, three rows and offers 20 fixed paylines, which pay left to right, starting from the leftmost reel. Three of a kind is the minimum for landing payouts. Before you start the hunt on Vampires and other creatures of the night, you should set the bet level and the coin value, so as to choose the most appropriate bet, which goes from £0.20 to £100 per spin. It is important to mention that every time a Wild appears during base game, a Walking Wild feature is triggered. Respins also start, while the Wild moves one reel towards left and the feature ends once there are no more Wilds on the reels. All wins involving Wilds will be tripled. Three or more Chest Scatters will start the Free Spins feature and gamers will get 10 freebies. Three or more Scatters during the feature will get you 5 extra free spins. The Walking Wild feature is also active during freebies, anytime the Wild lands on one of three central reels. The 3x multiplier also applies on all wins involving Wilds. Now, you can collect Lantern, which appear on reel 5 only, and you will get three types of extra Wilds. For three Lanterns spinners will get a 2-cell-high Stacked Hell Hound Wild for the next Walking Wild feature. Six lanterns during the Free Spins feature will get you a 3-cell-high Stacked Jack-o’-lantern Wild for the next Walking Wild feature. Finally, 9 Lanterns will get you the Expanding Death Reaper Wild. If you are brave enough and play the NetEnt title for a longer period of time, then you might expect a maximum payout of 600,000 coins, which is a huge win. 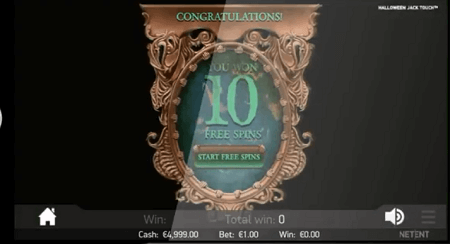 The Free Spins feature is where you should expect mind-blowing payouts. The female Vampire pays the most among regular symbols, offering 50 times the bet for five of a kind. Halloween Jack’s RTP is 96.28%. We do not advise players to enjoy the 2018 release in dark spaces, at least not until they get accustomed to the surroundings in Halloween Jack. It’s safer to play the video slot from a safe distance, somewhere outdoors, in broad daylight, with lots of people surrounding you. The NetEnt title is playable across all devices, meaning that you can play it anytime, anywhere. Believe us when we tell you that Halloween Jack will be a huge hit during the upcoming Halloween. Stunning visuals and an authentic soundtrack, combined with awesome special features will keep you busy for hours. Even scaredy-cats will want to enjoy the NetEnt title, due to the fact that it offers a mind-blowing maximum payout of 600,000 coins. Our personal favourite is the Free Spins feature, with three extra Stacked and Expanding Wilds that can be added to the Walking Wild feature, provided that you collect enough Lanterns. All in all, we already know what we will be doing this Halloween. 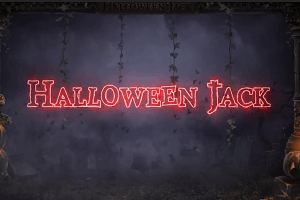 Play Halloween Jack slot at Royal Panda Casino!